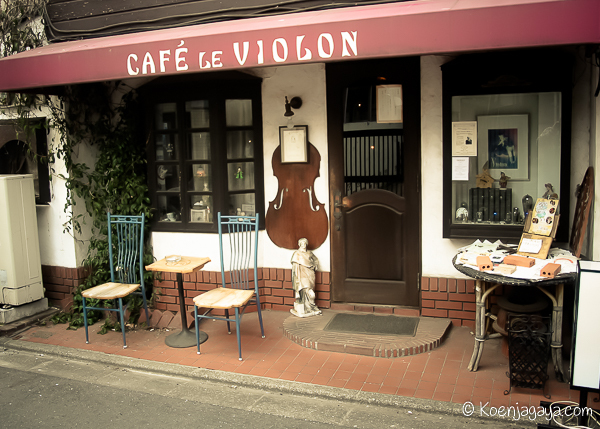 Café Le Violon in Asagaya is a wonderfully queer little place tucked away in Asagaya’s north side. At least to me. I could see a segue in a David Lynch passing through here. But it’s the first classical music café I’ve been to. 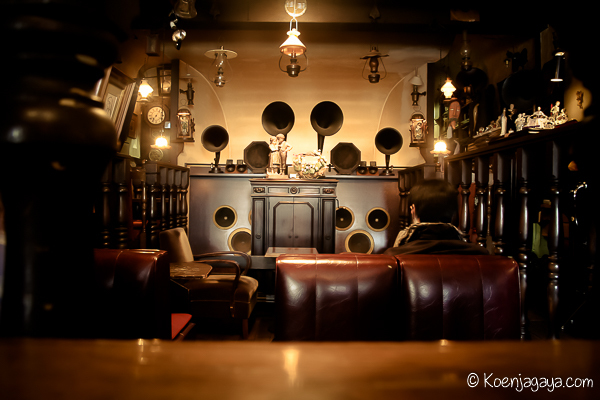 First appearing in the 1920’s and experiencing their heyday during the 1950’s–a time when LP’s and record players were not within most people’s budget–Japan’s meikyoku kissa (名曲喫茶 or classical music cafe) offer a tranquil escape where customers order a coffee (or other beverage), sit back and listen to classical music. They are not the place one goes for boisterous conversation or scintillating gossip. The lighting is dim. The furniture is dark and old. (It is actually the full interior of another meikyoku kissa that the owner acquired in its entirety and transplanted here.) The vinyl is piled high and long–in uneven stacks and rows more reminiscent of an antiquarian bibliophile’s private library. And the gramophones are bountiful. But don’t let this antique wall of sound fool you–it’s got some superior state of the art hi-fidelity equipment behind it. The menu is simple and straightforward: coffee, tea, cocoa, milk, orange juice or cola. All 350 yen. They also serve homemade cheesecake for 250 yen. It is rare cheesecake (ie: no-bake cheesecake) and fairly small, but something to nibble on as you take in your requested concerto. Even if you’re not a fan of classical music, you may find its serenity a nice little escape within Tokyo. It can be much more soothing than the sterile, fluorescent cafés so common here. Previous Post Tokyo’s. Best. Coffee.